I hope everyone is doing well, and catching lots of fish! I haven’t written an article in several months, but I have definitely been fishing. This winter has been above average on Big Snowbird Creek. 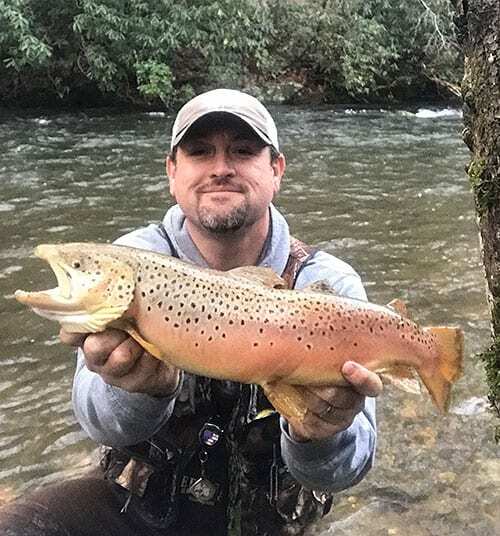 Lots of rain has had the water level above normal for this time of the year, and the trout numbers are doing great. Having fished almost every weekend through December and January, Snowbird Creek is thriving. The best days I’ve found have been what most would think is a day to sleep in. In high water, dingy water with cloudy sky’s, and even on rainy days, trout have fed. Bluebird Skies have shown very little action. The brown trout population is doing well, despite my having thought it was low. Delayed harvest section is also maintaining a good population of fish too. Previously in the past years Otters was said to be putting a hurt on Snowbird, but honestly, I don’t think that’s a problem if it ever was one. Angler traffic has also been low this winter; at the most, I’ve only seen a few people on the creek. Nymph droppers have been the ticket lately. A tip I’ll share is to move up on a good hole or pocket slow and low, especially on a clear day. On dingy rainy days, you can move more and I recommend throwing a streamer. Be patient, you may land a 20 plus brown. The fishing is good on Snowbird Creek, if you’re looking for a low pressure, winter trip come on over. Winter is my favorite time on the creek, with it’s calm and low pressure alone, allowing for enjoyment of Gods beautiful creation. James “Josh” Lane is a native of Western North Carolina in the town of Robbinsville. He is a long time avid fisherman and enjoys hiking, backpacking, writing and singing gospel music.